SINGAPORE — The Philippines flagged terrorists’ global funding schemes to homeland security authorities of Asia-Pacific countries, seeking cooperation to combat a wide international network of communist-infiltrated front organizations. 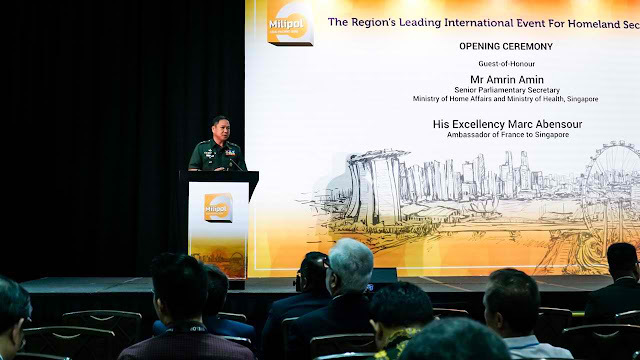 Armed Forces of the Philippines (AFP) Deputy Chief of Staff for Civil Military Operations, Maj. Gen. Antonio Parlade Jr., in his speech at the Milipol Asia-Pacific 2019 Conference in Singapore on Thursday, warned that the Communist Party of the Philippines (CPP) and its armed units, are masking themselves as humanitarian non-government organizations (NGOs) to secure funds from international donors -- which are then used to conduct terrorist activities. He said the 50-year-old CPP has already established an international network, named the International Department, comprised of some 252 member-organizations based in 39 countries. The group established 16 chapters abroad through the International League of Peoples’ Struggle (ILPS) headed by CPP chairperson Jose Maria Sison. “We foresee that this problem, if not checked can turn out to be a hybrid scheme that can be a transnational crime problem. The purpose of this presentation is to make you aware that there is such a thing, and because of how intricate these international funding is being done. It may not be in our radar,” Parlade said. He also named local organizations that are affiliated with the ILPS, such as the IBON Foundation, General Assembly Binding Women for Reforms, Integrity, Equality, Leadership, and Action (Gabriela), Alliance of Concerned Teachers (ACT), Karapatan, National Union of Peoples' Lawyers, among others. Parlade said these organizations conduct international solidarity missions where they publish inaccurate reports to portray a tyrant and oppressive Philippine government. He said these groups also lobby for funds from foreign institutions, claiming that they will be used for projects to solve the fabricated issues, but will rather be used to fund terrorist activities. The CPP-infiltrated organizations, he added, publish inaccurate information such as weak employment generation, and bloated figures on displaced indigenous communities, among others. “They've been fabricating reports, they've been tweaking, distorting reports so that the Philippine government will be perceived as incompetent, inefficient. They submit all these reports, false and fabricated reports, to the EU (European Union), UN (United Nations), and other governments, again for funding,” he said. In December 2018, President Rodrigo R. Duterte signed Executive Order No. 70, creating the National Task Force to End Local Communist Armed Conflict (NTF ELCAC). “This national task force is not only about a military or police solution, but it's about good governance. It's approaching the problem in many perspectives, and you can see there the 12 lines of efforts that we are using to engage the different CPP Programs. There's local government empowerment because this is about good governance. We are engaging our international stakeholders through our international engagements,” Parlade said. During the task force’s engagement in Europe earlier this year, Parlade learned that the Communist-affiliated NGOs were able to raise as much as 15 million euros over a five-year period from Belgium alone. He also found out that about 1.3 million euros will be remitted this year. “We have a long way to go. We have to analyze deeper, the links, the layers, and layers of organizations covering this fund generating scheme for the terrorists,” Parlade said.